branch in which they are appointed all over the India. The application form will not be accepted if it is delayed on the last date given for submission 25-05-2018. 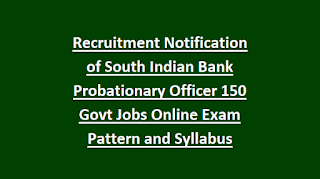 Online applications are accepted through www.southindianbank.com. For other details regarding the post of Probationary officer like pay scale, eligibility criteria, selection process, how to apply, and vacancies etc candidate is advised to read the full notification given below. 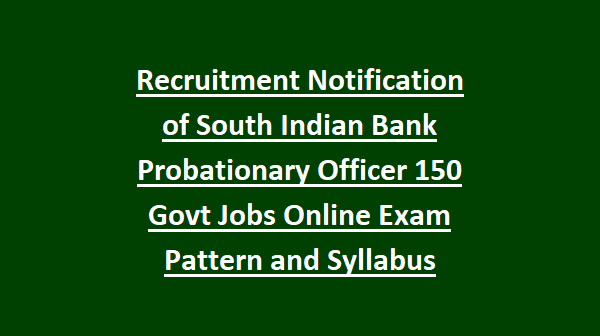 There is total of 150 posts opened for the recruitment of Probationary officer in south India bank. There are a total of 150 posts. Candidate is advised to check out official website for category wise vacancy details. Probationary Period is 2 years for qualified candidates. -Candidates upper age limit must not exceed the upper age limit of 25 years and lower age limit of 18 years. -Age limits are applicable for reserved candidates. Pay scale. Probable salary is Rs.23700-42020/-. For UR/OBC Rs.800/- and for SC/ST Rs.200/-. There are total 160 questions in this Probationary Officers recruitment. Written Exam will be conducted for 200 marks. Exam duration is 140 minutes. -After filling the details candidate must pay the exam fees through online payment mode.